View of the Temenos during the premiere of order VII of Gregory J. Markopoulos’s Eniaios, 1947–91, Lyssaraia, Greece, June 30, 2012. Photo: Linda Levinson. 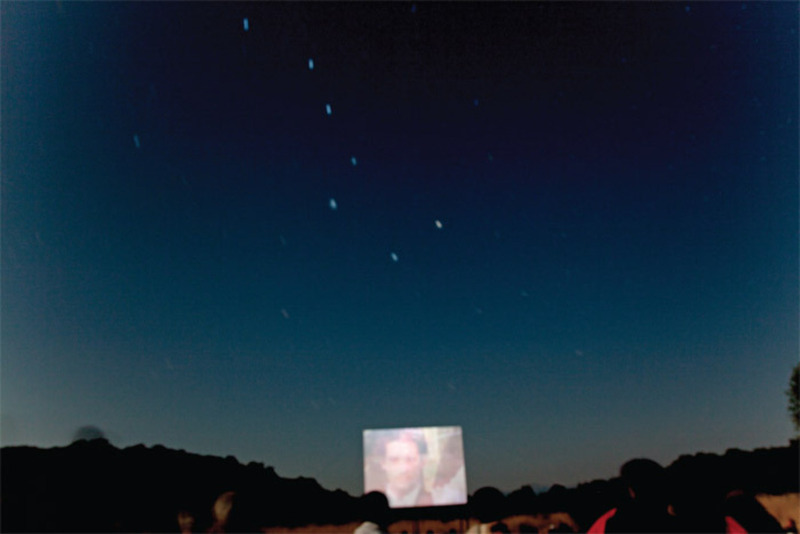 FOR THE THIRD TIME IN EIGHT YEARS, an international audience of filmmakers and enthusiasts made a pilgrimage to a field outside the remote village of Lyssaraia, in the mountains of Greek Arcadia, to witness the exfoliation of Gregory J. Markopoulos’s Eniaios (1947–91). The monumental film is shown in segments of approximately ten hours over three nights every four years in the Temenosliterally, a “sacred precinct”where, before his death in 1992, Markopoulos designated that the film should be shown. The audience that congregated this year, between June 28 and July 1, was the largest yet, straining the resources for accommodations in the nearby guesthouses. The three segments, or orders, as Markopoulos called them, confirmed Eniaios’s stature as an astonishing masterpiece.